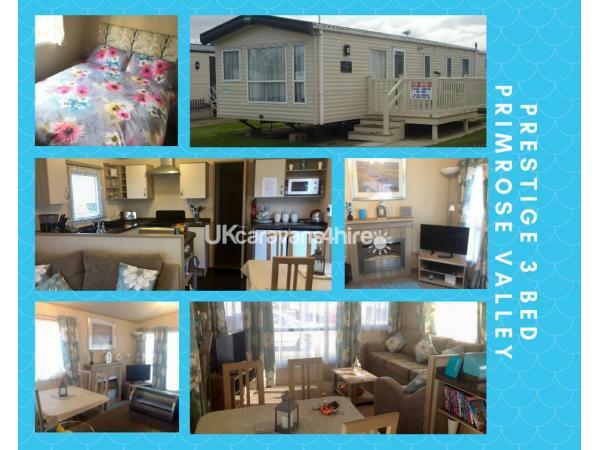 Beautiful 3 bedroom Prestige with decking graded caravan for hire. DG & CH. 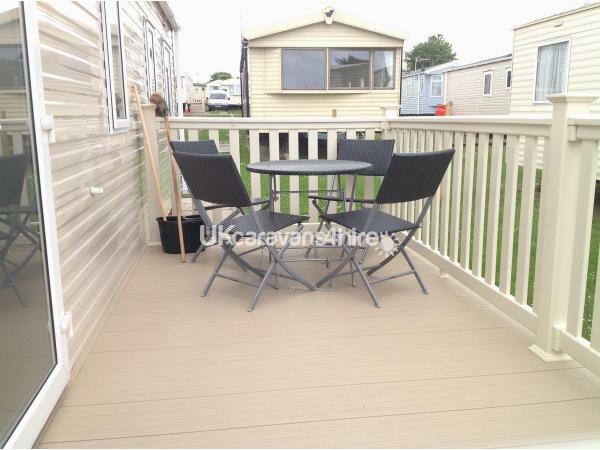 lockable veranda, private parking bay next to caravan. Available for short breaks or longer. Immaculately kept, managed and cleaned by owners. Sited on Pine Ridge in a lovely cul de sac. Close to main facilities. Bright and airy open plan living area thanks to the large front panoramic windows. 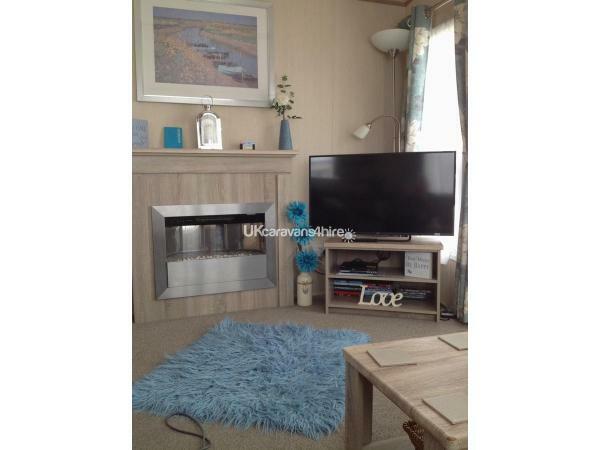 The lounge area has a comfy corner sofa, coffee table, TV unit with 40” LED TV and a DVD Player, a feature fireplace with electric fire, free standing dining table and 4 chairs. There is a large U shaped kitchen area containing full size fitted gas cooker with oven and grill with extractor above and lots of storage. There is also a separate worktop area with microwave above and under counter larder fridge and separate freezer so plenty of room to store your food. 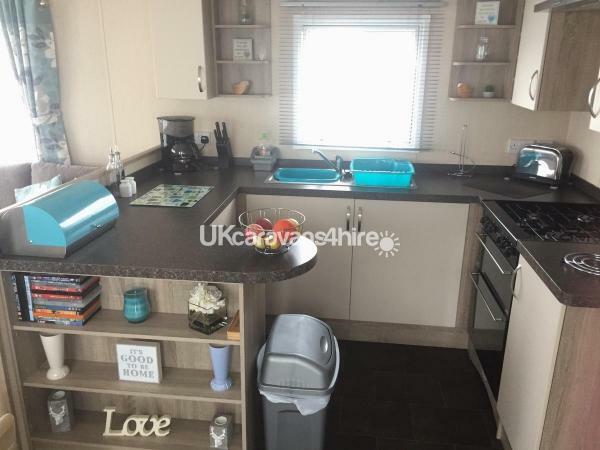 Kettle, toaster and all the pots, pans and cutlery you will need are provided Plenty of worktop space and storage including a built in wine rack. 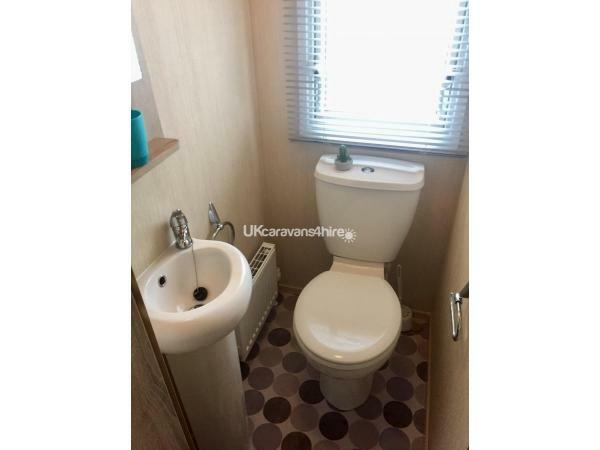 The bathroom has a large fully enclosed walk in shower cubicle, a handwash basin and toilet. 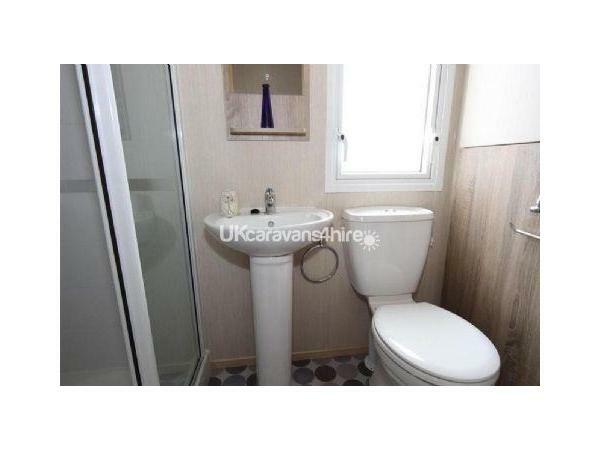 Also in here is a towel radiator, plenty of shelves to fit all your toiletries & towels on and the boiler cupboard. There is a second toilet and handwash basin so no queuing for the toilet. The bedrooms have been designed to make the best of the available space. 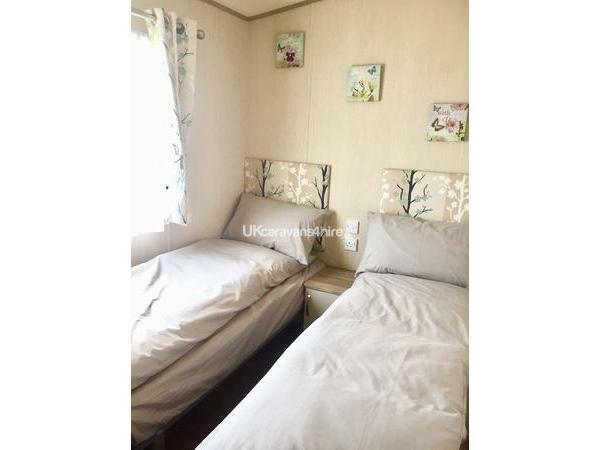 There are 2 x twin rooms and a double room. All bedrooms have comfy mattresses, warm duvets and fluffy pillows to help you get a good nights sleep. All have a wardrobe, bedside cupboard, mirrors and plug sockets, the master also has a small vanity unit and wall mounted 24” LED TV. Iron, ironing board, vacuum cleaner, hairdryer, travel cot and highchair provided free of charge. Sited within a small cul de sac close to main complex so not far to go to reach the action but no passing traffic so option of chilling at the van. Large veranda with table and chairs ideal for morning coffee or eating alfresco. Strictly no smoking or vaping allowed in the caravan. 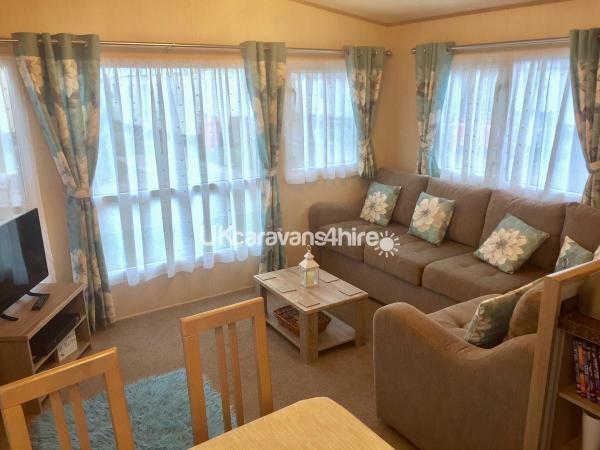 We allow 1 small, well behaved dog which must not be left in caravan alone. Parking space next to van so no looking for somewhere to park. If you want a little more luxury with a large veranda see our other advert number 2753 which is sited opposite the boating lake. Loads to do on site and in surrounding area. Close to Scarborough, Filey & Bridlington. Access to a gorgeous beach for traditional family seaside days out. 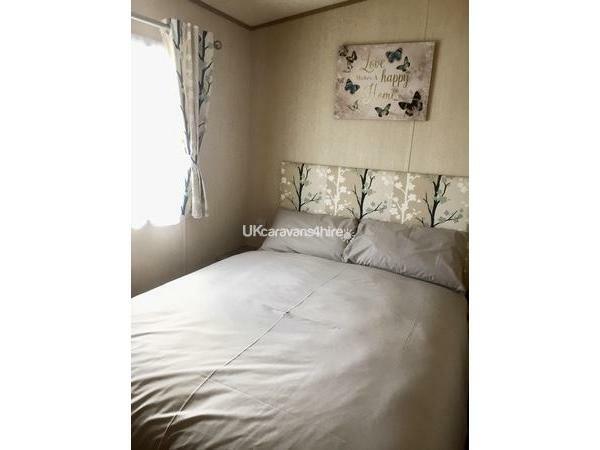 Lovely and clean caravan in a fantastic position, will definitely be staying again, if you need anything answering Sheila is just at the end of the phone, only wished we had stayed longer. Immaculate van with everything you need. Particularly liked the larger style kitchen! Everything you need. Owners were attentive and there if you needed anything. Thank you! Definatley recommend and will use again. Lovely caravan to stay in. Very homely and cosy. We thoroughly enjoyed staying here with our 10 yr old grandson. There were so many things supplied so if you did forget anything it was already there. eg. cleaning products,sugar, bin bags etc. The most thoughtful items were the dvds and dvd player which come in very handy. As for the park, it is really great with so much to do. Thanks for a quick and easy booking process and friendly communication.